The impression may be due to my lack of command of the Hungarian language, but most places in Budapest advertising the use of organic produce surely aim at the affluent tourist -- carefully designed places offering sophisticated Hungarian kitchen, vegan food or the ubiquitous expensive Italian coffee machine and hand-made organic sandwiches and cakes. What they all have in common: gorgeous food, a relaxed and (family-) friendly atmosphere and the complete absence of red-nosed binge-drinking tourists. 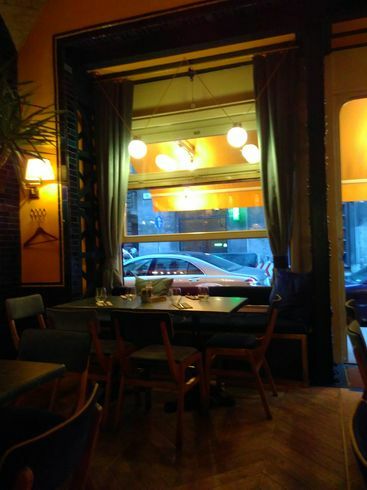 To dine in style head for the golden-blue shimmering premises of Hilda Food and Mood in Lipótváros serving carefully modernized standards of the Hungarian farmers' kitchen like the goulash soup or chicken paprikash with dumplings as well as advanced sandwiches or salads. The focus here clearly is on organic meat from responsibly raised animals, grilled to the point, but vegetarians are catered for with equal love, with often organic greens, crisp or perfectly done. There's also a selection of organic soft drinks and wines. 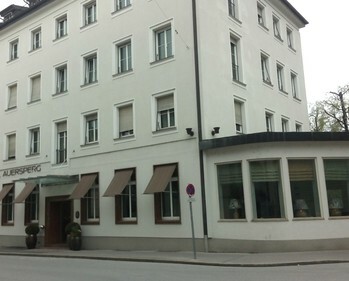 Unfortunately the restaurant is closed on Sunday evenings but you may also come here for breakfast, brunch or lunch, and if only to marvel at the grand-hotel flair, the mosaic walls, and the dusky pink-golden restrooms. Just a few corners in Eastern direction you'll find Naspolya Nassolda, a light and clean cafe serving raw, vegan, gluten-free sweets, savoury snacks, healthy drinks and coffee, using a great deal organic ingredients. Prepackaged wafers and cookies from the shop can also be bought from the BioABC supermarket. 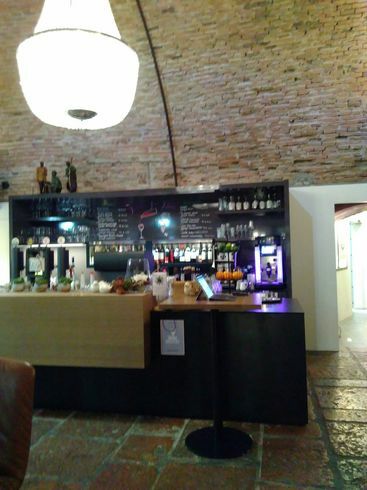 If you feel for a more lively coffee house atmosphere find your way to the Vörösmarty utca metro station in Terezváros and enter a stunning neo-renaissance building of the World Heritage Site of Andrassy avenue to find the Ecocafe. This cafe could be transfered to any other Western metropolis, and you wouldn't notice -- the Italian-style coffee drinks, the wooden tables, the hand-made croissants and sandwiches, the freshly pressed smoothies and small glass bottles with juice, the clean and understated eco design, the families, the students and the digital nomads, a welcoming, yet non-intrusive atmosphere -- it's all here, and you'll feel at home at once. And the best of it all: The place keeps open on national public holidays like St. Stephen's day when everything else (including the main post office within Keleti pu.) is closed. 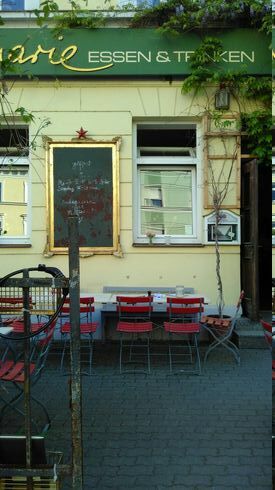 Right in the vicinity of Keleti station you may check out the Mennyország Szíve Bio Bolt for lunch or snacks, or -- hopefully soon again -- the Házikó Bisztro ("farm bistro") which currently is closed. Both are closed on weekends and public holidays. The Házikó has a second branch in Buda on the premises of the socially and environmentally responsible MagNet bank. Here you can have not only a coffee, but also lunch, snacks or an early dinner made from predominantly organic local produce according to season. 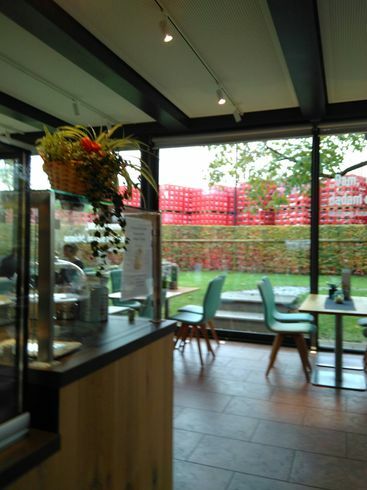 During my research I also found the following places that seemed likely to (at least partially) serve organic food and drinks, but I did not had the time to try them myself. If you do so let me know whether they are worth to be listed here! Forget about sushi, pizza, pasta, burgers, curries and other globalized commonplaces -- in Dresden it's much easier to find hearty home-cooked dishes made from locally sourced ingredients rooted in local and regional food traditions. This does not necessarily mean German -- mind you that the borders with Czechia and Poland are close, so many menus reflect influences rather from Eastern than Western or Southern European cuisines. Many dishes include meat, yes, but all the places I am covering here have a decent selection of tasty vegetarian options readily available. 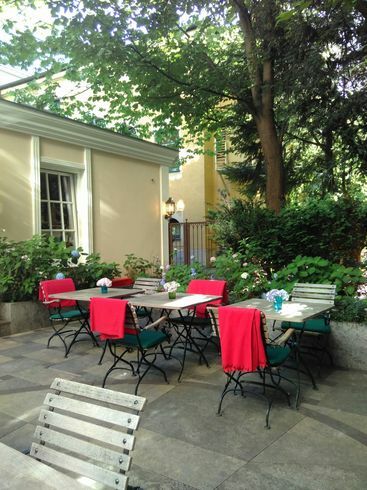 The most sophisticated ones in town may be had at Lingner restaurant on the premises of the neoclassical German Hygiene Museum ("Deutsches Hygienemuseum") marking the Western end of the 1x2 kilometres spanning inner-city park areal of Großer Garten ("Great Garden"). 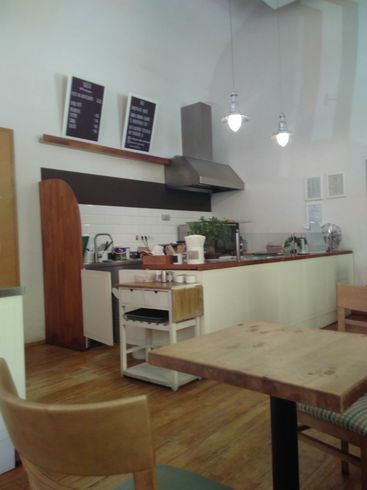 While you can step by for an Italian-style coffee drink (made with organic milk) and organic cake or a snack after a visit to the medical museum this is ways from the usual low quality self-service refectory to be found in many museums. They serve simple but decent lunch, all meat and meat products come from a local organic butcher's, the bread (though not the ice-cream which isn't organic) from an organic bakery in town, and many veges are also locally sourced and organic. Dinner starting at 5:30 pm is more sophisticated, and often thematically extending a current exhibition at the museum. While the outdoor terrace is popular during the warm season, dinner time during the winter season featuring a stylishly presented all-you-can-it buffet is perfect if you prefer it less crowded. When it comes to drinks both tea, milk, juices and some soft drinks as well as all spirits printed in dark-green font on the menu are organic. There's however no organic wine on offer (although a good selection of local ones). Due to the somewhat remote location call in advance if you plan to arrive after 9 pm. About ten minutes brisk walking from Hygiene-Museum will lead you to Cafe Aha (just across Kreuzkirche) which is covered here. Even longer west, facing the modern building of the University of Music in Schützengasse you may be surprised to find a small island of baroque buildings with a wild garden, housing the city's environmental center, and a great disappointment: The cosy rustic wholefood restaurant on ground flour dubbed Brennnessel ("stinging nettle") once used organic ingredients and still can be found listed as an organic restaurant, but alas! -- no more. 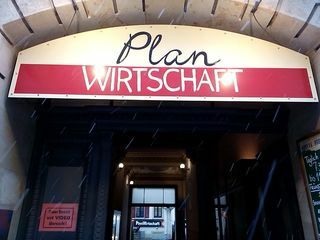 For rustic food and surroundings head for one of the oldest independent pubs in town, the Planwirtschaft ("planned economy") in the Neustadt neighbourhood, popular since its beginnings as an illegal pub in the late GDR. On mezzanine level they serve breakfast, lunch and dinner as well as coffee and cake while the basement houses a pub which opens in the evening. When it comes to their supplies they focus on buying from local farms and enterprises as the (unfortunately not organic) independent butcher's directly across the street or a tea shop next door from which they also source the organic teas on offer. The goat cheese is always organic. They used to have an organic meat dish (which was marked as "bio" on the menu), but unfortunately no longer. Have a tasty organic apple cider (no more organic beers at my last stay), and ask about organic ingredients. 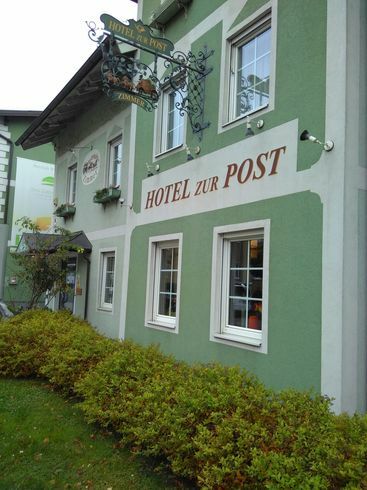 If you take the urban train number 2 from the Neustadt train station, either on the way to the airport or to a stroll in the woods of Dresdner Heide, get off Bahnhof Klotzsche (one stop before the airport) and have breakfast, lunch, tea or a snack in its 110 years old railway station. 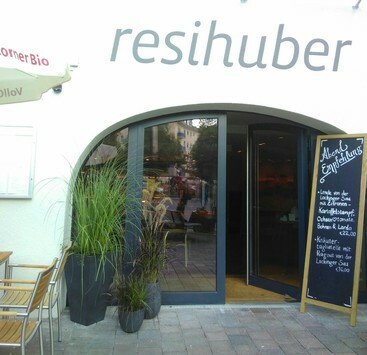 Since the folks of Vorwerk Podemus took over and restored the historical building in 2015 it has been home to a bicycle shop, an artist's studio, an organic supermarket, and the now fully organic station restaurant dubbed Bio-Bahnhofswirtschaft with its pleasant beergarden. 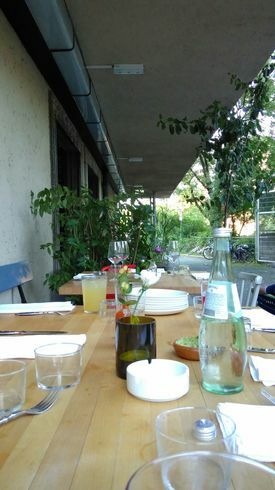 On Friday evenings from 5 pm the place also serves dinner or, May through September, a barbecue. Make sure to arrive well before 9pm as the kitchen keeps closing at this time. Travellers and ramblers may be glad to hear that they can fetch an organic breakfast or packed lunch on the go, though unfortunately not on Sundays as the restaurant is closed that day.